Get A FREE House Cleaning Estimate! Sometimes you just don’t have the time for housekeeping and when you make time, you’d really rather spend it doing the things you love. So even if it’s just one time, once a week, or once a month, treat yourself to a fantastic house cleaning job from one of our professional house cleaning maids – because you deserve it! Let our professional cleaning teams do the work while you enjoy your family and friends or just unwind from a long day or week at work. Customized to meet your needs. Occasional or scheduled. Get that house cleaned up to sell, rent, or move into. For homeowners, tenants, and real estate agents. We offer customized professional home cleaning plans and schedules to fit your needs and budget. We can provide one-time, weekly, biweekly, monthly, or custom house cleaning and maid services. You choose what you want cleaned, when you want it, and how often. We respect your request for any areas you care to have off limits. Our friendly and professional maid service teams do an excellent job and can get the hardest trouble spots clean. We bring the personal touch to every job. We know a house cleaning service has to be efficient, effective, affordable and totally reliable. Our hard working staff arrive on time, are extremely courteous, and respect your privacy. Attention to detail. You can expect sparkle and shine every time. A company you can trust. We provide exceptional service. Home cleaning that’s customized to your needs. A 100% satisfaction guarantee that you’ll love us. Our business hours are from 7a.m. to 5p.m. Monday–Friday and Saturdays from 7a.m. to 3p.m. Our service arrival time is approximate, we try our best to keep estimated arrival time, please give us one hour window for arrival time on your scheduled service day. What’s needed on the day of service? The home is expected to be cleared of clutter. Surfaces that are covered with clutter are very difficult to clean and in many cases not possible to clean. Please have all toys put away, laundry is in the laundry basket or washer, and clothes in the closet(s) or in the dresser(s). 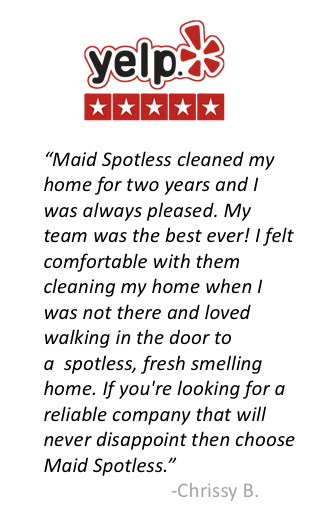 Yes, Maid Spotless guarantees our work for 24 hours. Please contact us within 24 hours of your cleaning service if we missed anything and we will return to re-clean any area(s) we missed at NO extra cost to you. Otherwise, the necessary correction will be made on the next scheduled appointment. How long does it take to complete service? The Full-Service/Deep Clean quote is an estimate of the hours needed to complete the agreed upon work. The home is expected to be in the same or better condition as on the day of the in-home bid. The customer agrees to pay for hours exceeding the estimate or will provide special instructions to Maid Spotless. The regular service is a flat fee quote and the hours are an estimate of the time needed to complete the regular service tasks as documented. Please secure your pets in a safe area on the scheduled service date. Pets left inside the home on the scheduled service date will be protected to the best of our ability. Maid Spotless will not be held responsible for the behavior of the pet(s) while the service is being performed. Maid Spotless reserves the right to refuse service on the scheduled date if an animal in the home is considered dangerous. Are occupants in the home on the service date okay? Individuals in the home while service is performed must not occupy the rooms while the cleaning is being done. It is requested that you move to other rooms and be mindful of our equipment for your protection and the protection of our housekeepers. When required, Maid Spotless house cleaners will need to use the air conditioning by lowering the thermostat to a comfortable setting to prevent heat exhaustion, fainting, and possible interior damage to customer’s home. Payment is expected at the time of service. We gladly accept payment in the following forms Cash, Personal Check and Credit Cards. If you’re not going to be home on cleaning service day please call our office to make payment arrangements or leave a check payable to Maid Spotless. Maid Spotless reserves the right to refuse service when an outstanding balance is due and payment is not left for the regular service. Once you become a regular customer you have the option in providing us a key for your house cleaning. Maid Spotless will safeguard the customer key(s) at all time. The key(s) provided by customer will be coded with an identification number only. The owner or a team lead of Maid Spotless will handle the key(s) on the date of service. Lost key(s) will be reported to customer immediately with replacement cost paid for by Maid Spotless. Is there a cancellation or no access fee? A cancellation fee of $25 will be applied to your account for all cancellations that occur less than 24 hours prior to your next scheduled appointment. Please call Maid Spotless in advance so that we may reschedule your appointment. There is a NO access fee of $50.00 for driving expense and losses if we’re unable to get inside your home on the day of service. Please understand, we hold the time slot open for you and turn away potential customers in order to hold your time frame. What equipment and supplies are used? Maid Spotless will provide all necessary equipment and supplies. Our housekeepers are trained and authorized to use the products and equipment of Maid Spotless. If you have specific products and equipment that you want our housekeepers to use please make pre-arrangements before service date by calling our office. We only use products that are authorized by customer. Maid Spotless will not be held responsible for any damages caused by customer supplies or equipment. Our house cleaning professionals are extensively screened. We perform thorough interviews, fingerprints, and background checks. For your protection, we are licensed, insured, and bonded. Are you insured for loss or damage? 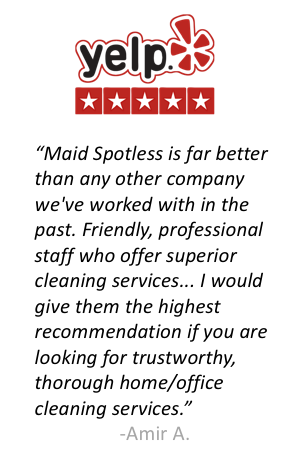 Yes, Maid Spotless is an insured company. We will always treat your home with respect and great care. We understand that some items are not replaceable. We prefer not to handle heirloom items. Accidents rarely happen, but we do not cover items that are one of a kind or rare items. 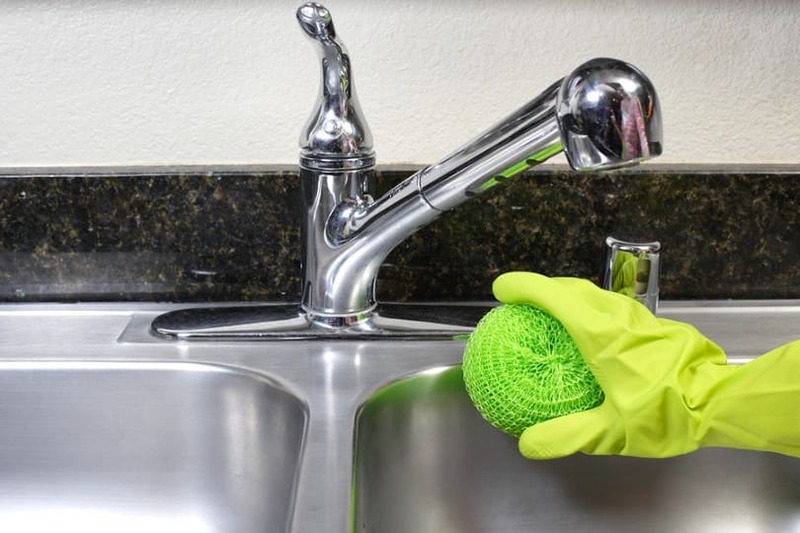 Housekeepers are required to document any damage found or incurred on the day of service and to report/call our office and notify the homeowner immediately. What if I need extra cleaning time on the service day? If you require extra time or additional cleaning on your scheduled cleaning day, please contact us 48 hours in advance to allow us to schedule the extra time needed at your home. Does the same team clean my home every time? We know how personal is to you to open your home to us and for that reason we send the same housekeepers to your home. Sometimes there’s unforeseen circumstance and we’re unable to send the same team but you can rest assured you’ll get the same high-quality service every time. All housekeepers have authorized and passed a background inspection by a certified agency. 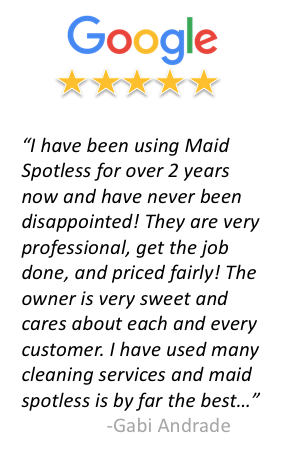 Customer’s are expected to report any concerns to Maid Spotless immediately. Our house cleaning teams never require tipping, but it’s a kind and thoughtful way to say thank you to your house cleaning team. All tips go directly to the housekeepers. We're a dedicated commercial office and residential house cleaning and maid services company. 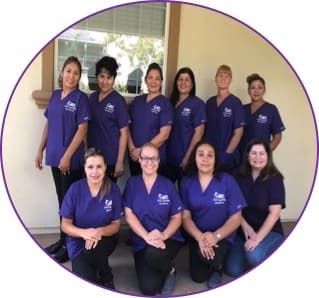 We're a woman-owned small business in the Temecula - Murrieta Valley and proud of providing professional high-quality cleaning services to our community.